Set on historic Amelia Island, close to local attractions and a short stroll from the beach, this Florida hotel features spacious guestrooms offering microwaves, mini-refrigerators and flat-screen TVs. After a restful night of sleep on the Hampton Inn Amelia Island's signature Cloud Nine beds, begin the day with a free hot breakfast buffet. Take advantage of the hotel's outdoor swimming pool and wireless internet access. Easily explore the historic town centre, filled with shops, restaurants and a Victorian village. 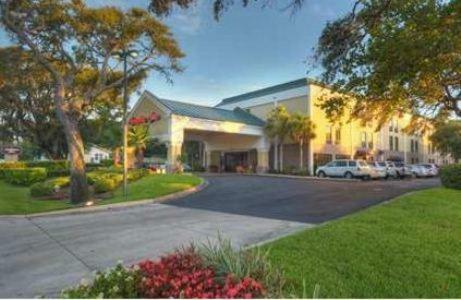 The Amelia Island Hampton Inn is also close to a number of golf courses, fishing tours and scenic parks. Please Note: until April 30th - Major renovation undergoing for the Fitness center, Guest Gift Shop, and laundry facility; a fresh coat of painting is being applied outside the building, please expect noise until 5:30 pm and dust but very minimum. All the rooms have been renovated. Upon check-in photo identification and credit card are required. All special requests are subject to availability upon check-in. Special requests cannot be guaranteed and may incur additional charges. . Guests must be 21 years of age or older to stay at the property. Guests are required to show a photo identification and credit card upon check-in. Please note that all Special Requests are subject to availability and additional charges may apply. the hotel Hampton Inn Amelia Island so we can give you detailed rates for the rooms in the desired period.